Rear Washroom, Fixed Bed, Extractor, Microwave, Fridge Freezer, Oven, Mains, Hot Water, Cassette Toilet, Shower, Battery Charger, Blinds, Flyscreens, Door Screen, Loose Fit Carpets, Wet Central Heating, TV Directional Aerial, Alarm, Stereo, Heki Roof Light, Hitch Head Stabiliser, External BBQ Point, Spare Wheel, Alloy wheels, GRP Side Panels, 12 Months Warranty, Finance Available Subject To Availability, Part Exchanges Welcome, This 2014 Compass Rallye 574 is in excellent condition and can be viewed 7 days a week in our family friendly showroom. The layout of this caravan is twin front lounge, side kitchen, twin fixed single beds and large end washroom with separate shower cubicle. 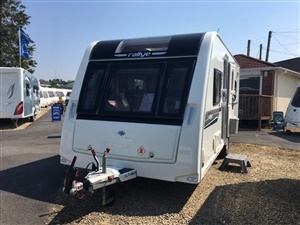 This caravan benefits from having the ALDE Wet Central Heating system meaning you can be warm and toasty whatever the weather!